Orlik De Luxe up for trade. Spent some time with this one and decided that we aren't a match. If you didn't see my post in the LPP thread, this pipe was unsmoked when I got it. So far I have put at least a dozen bowls of non-aro through it. It does have some little dings here and there, and some very light surface scratches on the bowl from handling prior to my ownership. Has the Dunhill style innertube stinger which extends all the way to the draft hole opening in the bowl(it's a perfect fit too, which you don't always see). Pipe or tobacco trade offers are welcome. As far as tobacco goes - Burley, VaPer, Lat/English, Lakeland, etc.. all welcome. Lancer's Slices and G&H Bob's Chocolate flake are two I am always on the lookout for. I am guessing the probability is pretty remote, but I've also been on the hunt for an African meer(Kiko, Jambo, etc). Not a lot of Orlik fans out there. It looks like a great pipe to me. The bowl is smaller than I prefer, but there has to be interest out there. There are lot of folks who find the 3/4/ in bowl size to be their sweet spot. Maybe @houtenziel could offer a suggested $$$ value on his pipe... what he thinks it's worth if someone offered him cash... that way people can better estimate what a fair tobacco offering might be. I think it's a great looking pipe, too. 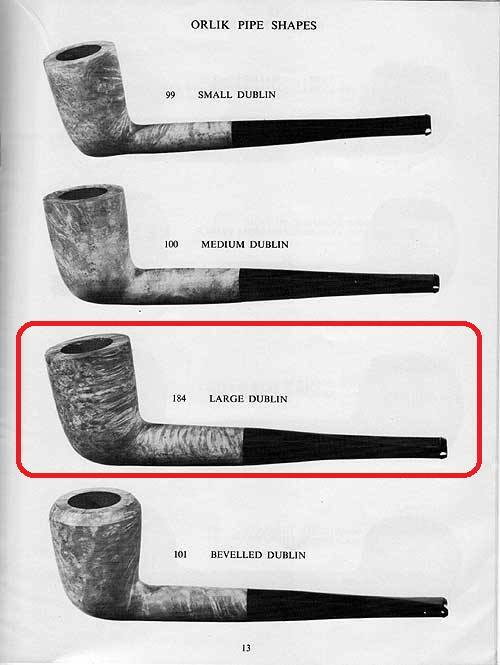 Regardless of maker, I am a fan of the straight Dublin shape. I couldn't find anything in this shape to get a bead on price, but I think $40-50 range seems a fair valuation. Other Orlik De Luxe pipes are going for about $75 or so, where I've seen them listed as estates.. and that seems a little steep. I am terrible at assigning value to things though, so I could be way off base. It's value to me is only what someone is willing to actually pay/trade, so I am totally flexible and ultimately just want whoever gets it to be happy. Was that non-committal enough of an answer? Here, let me be more concise. If you have some quantity of tobacco that you think I might like and you want to offer it up, regardless of value, please feel free to make an offer! You da man! Someone really needs to jump on this...that's a great looking pipe.